Peter moved from Hull Quebec at the age of four with his family and became a resident of the North Grenville community. Thirty years ago this year he opened the only local Taekwondo school, affiliated with Grand Master Tae Eun Lee. 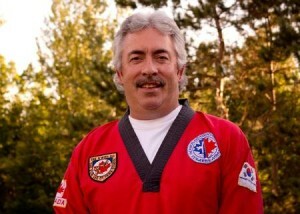 He began instructing classes in the art of Taekwondo for young people and adults. He has trained twenty eight black belts and has seen many students use their training in their choice of a healthy lifestyle. Over 4,000 students have been a part of the program.His program and style has been to develop discipline and respect in his students for themselves and others which is a key focus of the sport. The program develops ones’ ability to be courteous, loyal and have perseverance. The benefit of this discipline and Peter’s dedication to his students are key elements to the school’s success. Peter has made a commitment to Taekwondo training and its benefits which included weekly instruction classes, self defense classes and fitness training. Peter himself holds a 2nd Degree Black Belt. He has transferred his understanding of the key elements of the sport to his students and built a strong program. Peter’s abilities as a builder in this sport are evident in the school’s success and longevity in the community.